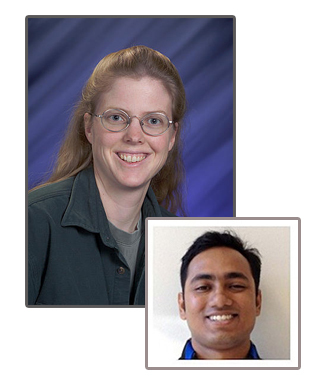 Dr. Wendy Shaw and Dr. Arnab Dutta at Pacific Northwest National Laboratory and their colleagues from France had their work highlighted in Nature Energy and ChemistryViews. The highlights, "Fuel Cells: Bio-inspired design" and "Platinum-Free Hydrogen Oxidation," describe the team's work on integrating a synthetic catalyst into proton exchange membrane fuel cells. Hydrogenases are natural catalysts that drive the reversible conversion of protons into hydrogen. These reactions can be used in a fuel cell to produce electricity without fossil fuels. The team examined these natural catalysts and produced a nickel-based catalyst that is easier to produce than hydrogenases. In addition, the synthetic catalyst can operate at conditions that would disable its natural counterpart. To learn more about the research, see the article in Angewandte Chemie International Edition.